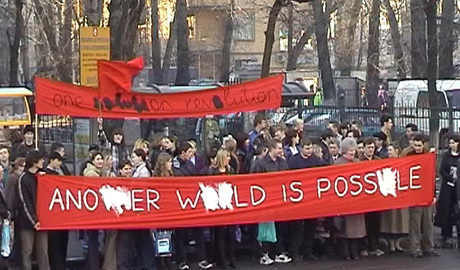 The video Manifestations records spontaneous demonstrations in Moscow. An apathetic crowd is seen waiting at a red light on a street crossing. 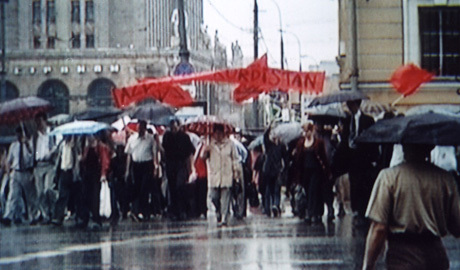 As the light changes to green, people start walking, while red banners with revolutionary slogans from the 1968 student unrest in Paris are held above their heads. By means of a simple intervention – creating an "instant group of followers" – the Radek group makes an ironic comment on the general disinterest in politics that can be observed in many transitional countries and the uninformed political choices people tend to make.